*Prime Yonge & Eglinton! *The Montgomery Is Proudly Presented By Rockport+Managed By Rhapsody! *Brand New+Ready Now! *Outstanding Community+State Of The Art Amenities! *Condo Style Living In The Heart Of Midtown Just Steps To Subway,Ttc,Shopping,Restaurants+All Amenities! 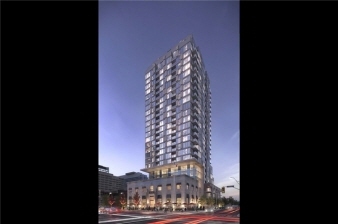 *Spectacular 1+1Br 1Bth West Facing Suite W/Balcony! *Lots Of Floor To Ceiling Windows+Light W/Panoramic Cityscape Views! *Fab Flow For Entertaining! *Approx 669'! *Move In Now! Additional Features and Amenities *S/S Fridge+Stove+B/I Dw+Micro,Stacked W+D,Elf,Window Covers,Luxury Vinyl Tile Flooring,Quartz,Year Round Heating/Cooling,Bike Storage,Optional Unreserved Parking $250/Mo Or Reserved Parking $325/Mo,Optional Locker $75/Mo,24Hrs Concierge++!